The bustling city of Cardiff will be celebrating its centenary as a city and 50th year as Wales' capital in 2005. With celebrations round the corner, it is the right time to pay a visit to the grand city of UK. Cardiff city is well served by all modes of transport including roadways, airways and waterways. The transport facilities in Cardiff include an excellent network of road and rail transport linking the city with the rest of Wales and England. You can reach the transport links in Cardiff through the Cardiff County Council's home page. 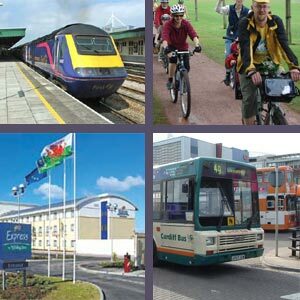 The County's transport information site provides details on transport in Cardiff along with Cardiff transport links. Cardiff transport links also lets you find the modes of transport available in the city alongwith information charts. Car rental is the most preferred method of transport in Cardiff, especially for excursions outside the city. The city is well served with good roads and motorways that make it convenient to travel around the city of Cardiff. Cardiff is well served with an international airport, Cardiff International Airport (CWL). The airport is served with regular and direct flights from UK and European destinations. The airport is well connected to the city centre and can be accessed by either train, coach or car. You can fly to Cardiff from London's Heathrow and Gatwick Airports. Cardiff transport includes buses and coaches that serve as regular means of travel for both locals and visitors. The Cardiff bus system has regular services to other parts of the county. The road transport services take you comfortably to many other towns and cities, including nearby locations such as Exeter, Bristol and Birmingham. There are also luxury coaches offered by the National Express coaches that operate from the city throughout UK. Most of the buses and coaches start from the bus station in Wood Street, Cardiff though there are several bus stops in the rest of the city too. The transport in Cardiff includes high speed inter-city trains that links most cities in UK. The Cardiff station is located in Central Square and is close to Cardiff bus station. Many train companies operate at the Cardiff Central station, the prominent ones being Virgin Trains, First Great Western and a few local operators. Regional railways operate modern air-conditioned trains direct to Cardiff from Birmingham, Manchester, Liverpool, Nottingham, Bristol, Southampton, Exeter, Torbay and Portsmouth. The Cardiff transport also includes taxis that are fairly inexpensive and convenient way to travel around Cardiff. Pick up Cardiff's taxis from various taxi ranks operating at the city's central train station and other important locations. The popular mode of transport in Cardiff is bicycle. The city is well served with cycle trails and pathways especially along the scenic riverside. The city is looking for the ULTra (Urban Light Transport) system, that is yet to emerge in Cardiff by 2005. The ULTra is an automated light transit system composed of small vehicles of maximum 4 passengers. These rapid transit system will not have drivers and operates on its own guideway, which can be either at ground level or elevated.